A Wigan man will spend the rest of the year behind bars as he awaits trial for a brutal attack. Anthony Sherburn appeared before a judge on Friday to plead not guilty to the attempted murder of Sharon O’Reilly who remains seriously ill in hospital and still has not regained consciousness since she was injured more than a month ago. The 36-year-old of Darlington Street East, Scholes, was arrested after the woman was found unconscious in an alleyway off nearby Bryham Street, with a traumatic head injury last month. Ms O’Reilly was treated at the scene by paramedics and then taken to hospital where she was said to be in a critical condition. Her family has told the Wigan Post that she is now off her life support machine and is breathing on her own, but she still hasn’t woken up. Medical experts have told them that there is tissue damage to her brain and relatives don’t know how she is going to be when she wakes up. Emergency services were called to the ginnel after members of the public reported a disturbance after 2.10am on Thursday, August 9. The area was sealed off as forensic investigations were carried out along with house-to-house inquiries. 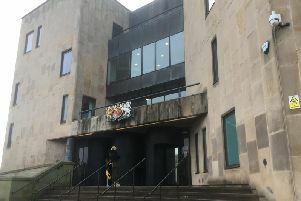 A house in Darlington Street East was later subjected to similar scrutiny and Sherburn was arrested on suspicion of Ms O’Reilly’s attempted murder. Two days after the incident he appeared before Manchester magistrates having been charged with the crime and, because of the seriousness of the case, it was sent to Bolton Crown Court from where he was remanded in custody. Since then the case has been switched to Manchester Crown Court, Crown Square, and it was there that he appeared on Friday to deny the charge against him. The judge set the date for a trial to begin on Tuesday January 22 2019 at the same court, and it was ordered that Sherburn be remanded in custody until that date.